WASHINGTON, DC – On Thursday. 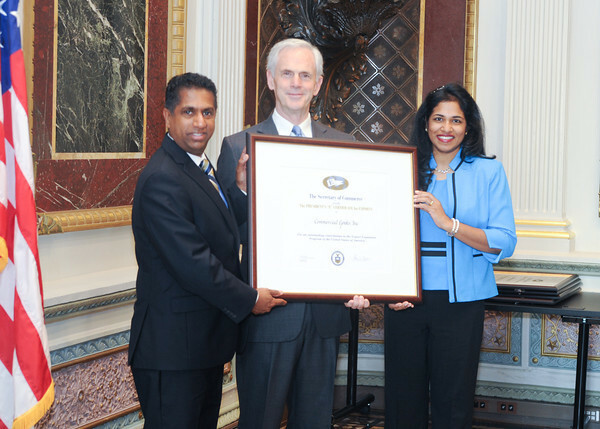 May 17th, Commercial Lynks Inc. (CLI), was awarded the Presidential “E” Award for Exports by U.S. Department of Commerce Secretary John Bryson in a ceremony at the White House. The “E” Awards are the highest recognition any U.S. entity may receive for making a significant contribution to the expansion of U.S. exports. “Exporting is the key to our success, and we are honored to receive the “E” Award,” said Jayaraman Gnanasekaran, President and CEO of CLI. “Since our humble beginnings in the year 2000, we have had steadfast growth, year after year, enabling us to sustain jobs and offer additional employment opportunities." CLI, based in Alexandria, VA, is an export house that specializes in trading North American agricultural commodities and consolidated food products. CLI sources commodities, arranges inland transportation and ocean freight to deliver products to its customers worldwide. With a diverse portfolio of products and dedicated staff, CLI is able to offer consistent quality products and efficient delivery. On the home front, CLI works closely with farmers, elevators and producers in order to create a sustained market for U.S. agricultural products worldwide. A business client of the Department of Commerce’s U.S. Commercial Service (USCS) in Arlington, CLI has benefited from export counseling, trade shows, market research, and business matchmaking to greatly expand its export sales. While India and Far East Asia represent a significant portion of the company's foreign market sales, the firm does business in several other regions of the world as well. CLI demonstrated a substantial increase in the volume of exports over a four-year period, a major criterion for the award. U.S. companies are nominated for the “E” Awards through the USCS’s office network in 108 U.S. cities and more than 75 countries, which are dedicated to helping U.S. firms export. “E” Awards are awarded to applicants that can demonstrate a significant contribution to U.S. export expansion that is measurable, innovative, sustainable, and has broad impact.